Degradation of the cyanobacterial protein pigment complexes, the phycobilisomes, is a central acclimation response that controls light energy capture. The small protein, NblA, is essential for proteolysis of these large complexes, which may reach a molecular mass of up to 4 MDa. Interactions of NblA in vitro supported the suggestion that NblA is a proteolysis adaptor that labels the pigment proteins for degradation. The mode of operation of NblA in situ, however, remained unresolved. Particularly, it was unclear whether NblA interacts with phycobilisome proteins while part of the large complex, or alternatively interaction with NblA, necessitates dissociation of pigment subunits from the assembly. Fluorescence intensity profiles demonstrated the preferential presence of NblA::GFP (green fluorescent protein) at the photosynthetic membranes, indicating co-localization with phycobilisomes. Furthermore, fluorescence lifetime imaging microscopy provided in situ evidence for interaction of NblA with phycobilisome protein pigments. Additionally, we demonstrated the role of NblA in vivo as a proteolysis tag based on the rapid degradation of the fusion protein NblA::GFP compared with free GFP. Taken together, these observations demonstrated in vivo the role of NblA as a proteolysis adaptor. Additionally, the interaction of NblA with phycobilisomes indicates that the dissociation of protein pigment subunits from the large complex is not a prerequisite for interaction with this adaptor and, furthermore, implicates NblA in the disassembly of the protein pigment complex. Thus, we suggest that, in the case of proteolysis of the phycobilisome, the adaptor serves a dual function: undermining the complex stability and designating the dissociated pigments for degradation. NblA intercalates into the rod structure, thereby undermining the association between adjacent pigment subunits, resulting in detachment of NblA associated with small pigment assemblies. As rod degradation progresses, the core pigments become accessible to NblA, and the phycobilisome core is disassembled. Designations: Photosynthetic reaction center II (PSII, green), allophycocyanin (APC, light blue), phycocyanin (PC, blue) and dimers of NblA (orange). The Plant Journal 2014 Jul;79(1):118-26. The proteolysis adaptor, NblA, initiates protein pigment degradation by interacting with the cyanobacterial light-harvesting complexes. Sendersky E, Kozer N, Levi M, Garini Y, Shav-Tal Y, Schwarz R.
The cyanobacterial light-harvesting complex, the phycobilisome, is degraded under nutrient limitation, allowing the cell to adjust light absorbance to its metabolic capacity. This large light-harvesting antenna comprises a core complex of the pigment allophycocyanin, and rod-shaped pigment assemblies emanating from the core. NblA, a low-molecular-weight protein, is essential for degradation of the phycobilisome. NblA mutants exhibit high absorbance of rod pigments under conditions that generally elicit phycobilisome degradation, implicating NblA in degradation of these pigments. However, the vast abundance of rod pigments and the substantial overlap between the absorbance spectra of rod and core pigments has made it difficult to directly associate NblA with proteolysis of the phycobilisome core. Furthermore, lack of allophycocyanin degradation in an NblA mutant may reflect a requirement for rod degradation preceding core degradation, and does not prove direct involvement of NblA in proteolysis of the core pigment. Therefore, in this study, we used a mutant lacking phycocyanin, the rod pigment of Synechococcus elongatus PCC7942, to examine whether NblA is required for allophycocyanin degradation. We demonstrate that NblA is essential for degradation of the core complex of the phycobilisome. Furthermore, fluorescence lifetime imaging microscopy provided in situ evidence for the interaction of NblA with allophycocyanin, and indicated that NblA interacts with allophycocyanin complexes that are associated with the photosynthetic membranes. 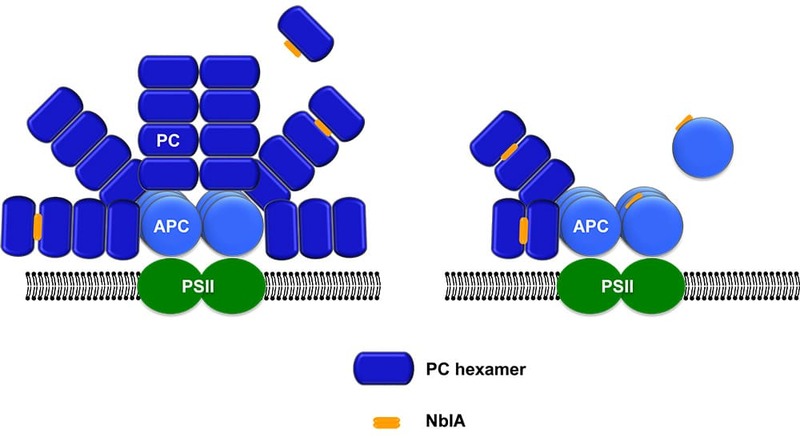 Based on these data, as well as previous observations indicating interaction of NblA with phycobilisomes attached to the photosynthetic membranes, we suggest a model for sequential phycobilisome disassembly by NblA. The Plant Journal 2015 Sep;83(5):845-52. The proteolysis adaptor, NblA, is essential for degradation of the core pigment of the cyanobacterial light-harvesting complex. Sendersky E, Kozer N, Levi M, Moizik M, Garini Y, Shav-Tal Y, Schwarz R.
Adjustment of photosynthetic light harvesting to ambient conditions is essential to allow efficient energy capturing and to prevent surplus excitation and the cellular damage resulting from it. Degradation of the cyanobacterial light harvesting complex, the phycobilisome, is a general acclimation response occurring under various stress conditions. This study identifies a novel component, NblC, which mediates phycobilisome degradation under nitrogen, sulphur and phosphorus starvation. Our study indicates the requirement of NblC for efficient expression of nblA, an essential component of the degradation pathway; accumulation of nblA transcripts upon nutrient starvation was impaired in the NblC-mutant. Furthermore, expression of NblC under the control of a foreign promoter resulted in accumulation of nblA transcripts and degradation of the light harvesting complex. Transcription of nblC is induced upon nutrient starvation, suggesting the requirement of elevated levels of NblC under these conditions. Importantly, NblC could not exert its positive effect on nblA expression in the absence of the response regulator NblR. Sequence alignment suggests kinase motifs as well as homology of NblC to anti-sigma factors. Accordingly, we suggest a mode of action for this newly identified modulator, which provides new insights into regulation of gene expression in response to environmental stimuli. NblC, a novel component required for pigment degradation during starvation in Synechococcus PCC 7942. Sendersky E, Lahmi R, Shaltiel J, Perelman A, Schwarz R.